We’ve been towing boat trailers around for years and assumed that our trailer’s tires were “just like car tires.” Boy, were we mistaken, and that’s why we’ve ended up changing tires too many times beside the interstate. We’re not the only folks who have paid the price for our ignorance. Boat U.S. reports that the majority of the calls for help to their Trailer Assist division (41 percent) come from boaters having tire problems. Like most boat owners, we take pride in our nautical knowledge. We talk to our friends about the latest gear and scan catalogs and web sites to see what’s new. But tires for the trailer? How boring! Take a moment to read this, and we’ll deflate some trailer tire myths, and perhaps help you avoid some of the roadside messes and blown-out tires we’ve experienced. Trailer tires aren’t like auto or light truck tires. They don’t steer, transmit power from an engine to the road or swerve to avoid obstacles. Automobile tires perform all of these functions, so they need flexible sidewalls to keep their tread anchored to the pavement. Car tires are mated to sophisticated suspension, steering and braking systems; free-spinning trailer tires, on the other hand, sit underneath stiff suspensions while smaller trailers don’t have brakes at all. Ultimately, using automobile tires on your trailer is a safety issue, which is why the experts at the tire companies do not advise their use. 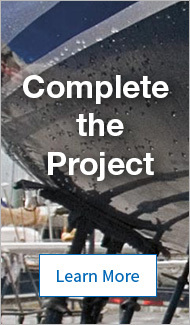 Radial tires are available from West Marine to fit 12" to 16" wheels. Special Trailer (ST) tires are designed for your trailer’s requirements. Their stiff sidewalls help prevent your rig from swaying. Their heavy-duty load capacity is critical; ST tires have 10% more load capacity than equivalent light truck (LT) tires and 40% more than passenger car (P) tires. They’re designed for trailer wheels, typically narrower than those on a car, and have shallower treads so they wiggle less to help improve your tow vehicle’s fuel economy and run cooler. According to rubber industry research, trailer tires need to be replaced after 3–5 years of use, even though they usually appear to have plenty of tread left. Unlike your car’s tires, it isn’t miles of driving but oxidation of the rubber that wears out the tire. Mostly, a trailer tire sits in one spot for days or weeks at a time, and may travel only 10,000 miles (or sometimes a lot less) per year. UV radiation from sunlight and ozone from exhaust cause exterior damage to the sidewalls, and oxygen from pressurized air creates unseen damage deep inside. Under-inflation is the prime cause of tire problems, and an under-inflated trailer tire won’t sag like your car’s tires because of its stiff sidewall construction. We recently pulled into a gas station with our 21' boat and checked our pressure. Both tires looked perfectly normal, but our pressure gauge showed that one tire had only 15psi (instead of the rated 50psi), which would have quickly destroyed the tire. Don’t eyeball it! Check your tire pressure with a quality gauge. 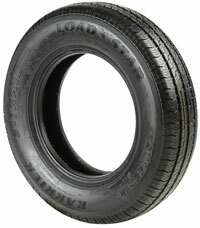 We sell both bias-ply and radial ST tires complete with wheels. Radial or Bias Ply Tires? Radial tires have plies that run perpendicularly across the tire and belts (often made of steel) running below the tread around the tire’s circumference. Bias ply tires have their plies running at 30° angles (like the stripes on a candy cane). Most motorists believe radials are better (and they are for your auto). Should you buy them for your trailer? The answer depends on your trailer’s handling. Bias ply tires have stiffer sidewalls, so if your rig tends to sway, they may help reduce this problem. They also have advantages for carrying heavy loads. Radials, as most of us know, are vastly superior for tread wear. They’ll last an average of 40,000 miles vs. 12,000 for bias plies. However, oxidation, not tread wear, wears out trailer tires. Radial tires are also less prone to developing flat spots on one side when they are parked in the same position for weeks at a time, and tend to run cooler on long trips. 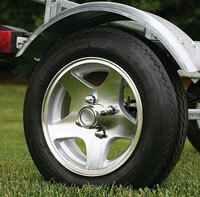 Bottom line: consider your trailer’s handling and the manufacturer’s recommended tire type. If you travel long distances and/or put lots of miles on your tires every year, radials are worth the extra cost. Each of your trailer’s tires should be the same type, size and construction—do not mix bias-belted and radial tires. In selecting tires for your trailer, buy the size, type and load range found on the trailer’s certification label or in the owner’s manual. Keep in mind that tires have a load rating that indicates the amount of weight they can carry safely. That includes toys, Igloo coolers and camping gear. Overloading can lead to a large heat buildup, causing accelerated wear or a blowout. Maintain pressure at the maximum PSI recommended on the tire’s sidewall for cool running, load-carrying ability and lowest rolling resistance. Keep a cap on the valve stem to prevent contamination of its internal rubber valve. Always carry a spare and check its pressure along with your trailer’s other tires. Don’t overload trailer tires. Maximum load is listed on the sidewall. Single axle tires can handle 100 percent of their rated load. Dual axle tires must have their loads reduced by 12 percent below the rated amount. Visually inspect your tires before each trip. Check the pressure before you use your trailer. On long trips you should check your tires’ pressure every morning when the tires are cold. For long-term storage, cover your tires for UV protection or keep them in a cool, dry place. Replace every three to five years, regardless of tread wear. Click on this guide to learn more about what to look for in the wear patterns of your trailer’s tires. How To Read Tire Wear.